Your ‘Consulting Detective’ wishes all a happy, healthy and prosperous New Year! The next gathering of the Stormy Petrels will take place in honour of the birthday of Mr. Sherlock Holmes. 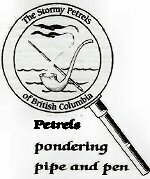 The Petrels will flock to The White Spot Restaurant at 1616 West Georgia Street (at Cardero) at 11:00 am on Saturday, January 8, 2011. It will be, as usual, an informal brunch. * The first member or guest at the Birthday Brunch to correctly give me the answer to the year of birth shall be rewarded with a prize. I am hoping to see many Petrels and Friends attending, as it is a great way to begin a new Sherlockian-filled year!